The Gen. Abdusalam Abubakar-led National Peace Committee has expressed concern over the security situation in Rivers, the Northeast and other parts of the country. The committee will be meeting with chairmen and secretaries of parties today to design a memorandum of Understanding (MoU) to be signed by their presidential candidates as part of efforts to ensure peace before, during and after the elections. 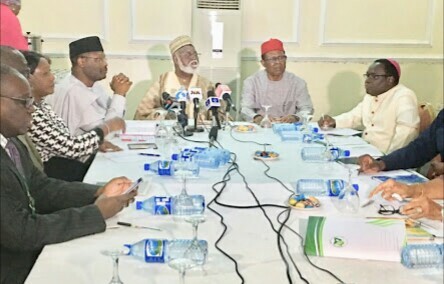 Briefing newsmen after the committee’s meeting with some Independent National Electoral Commission (INEC) led Chairman Mahmood Yakubu, Abubakar stressed the importance of peace in nation building. Abubakar noted that from briefing, the commission is 100 percent ready for the election, notwithstanding that its budget is yet to be signed. He said: “We have invited the chairman of INEC and he has come here with his high-power delegation. For the last one hour or so, he has briefed us on the preparation for the elections, his challenges and what he is going to do in order to make sure they are successful, free and fair. On other challenges the former Head of state identified imposition of candidates by parties. He said: “well mainly on the activities of the political parties. You have seen during the primaries either direct or indirect, or whatever it is, we have seen the report from you the media people where there are impositions of candidates so these are part of the challenges. On the campaign so far, he said: “Well, all we can do is to sanitise the polity to make sure that there is no hate speech, to make sure that it is a decent campaign during elections where there will be no name calling and undesired utterances,” he said. The committee’s advice to INEC, he said “like all Nigerians, we pray and hope and we got assurances that INEC will do the right thing. Each Nigerian has a role to play and I hope they will play their part. Abubakar went on: “As far as INEC is concerned from the briefing we received, they are ready pending of course what the parties do. So now the ball is in the court of the political parties to get their acts together. “The next stage is that we are going to meet with chairmen and secretaries of political parties tomorrow (today) in order to discuss and listen to them and to see how we can make progress. After the meeting with the political parties, we are going to draw a memorandum of understanding for peace and tranquility and this we hope will be signed by all the presidential candidates and the chairmen of all the registered political parties,” he said. He urged the press to “properly inform” the general public, saying “You members of the press have also a role and a duty to educate our people and the politicians so that when they go on campaign, they campaign on issues and there should be politics without bitterness and rancor. You also help us educate our citizens so that they avoid been used as tugs during campaign and during elections. You also help us to educate Nigerians on their citizen’s right to ensure that they check that they receive their permanent voters card (PVCs) and ensure that their names are properly registered, to avoid ballot snatching and all types of hooliganism during the elections. Yakubu said the meeting would be part of a regular dialogue with the committee ahead of the elections.